When I found out that DavidsTea was getting a new collection of straight teas in, I was curious. I’m a sucker for a good straight tea so when I walked into my local DavidsTea shop I asked to smell all of them (there are three) and then I went ahead and bought a small bag of each. The nice thing about living locally to a DavidsTea location is that I don’t have to purchase a full 50g of each tea (like I would if I was ordering online). Happy Valley Darjeeling is an organic black tea from Darjeeling, India. 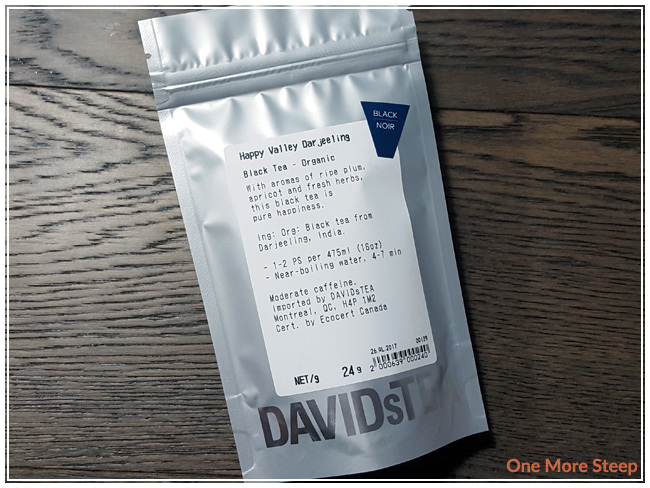 As per the product page, DavidsTea describes the tea as a second flush tea from Happy Valley, a tea estate in Darjeeling with a long, rich history of producing tea. 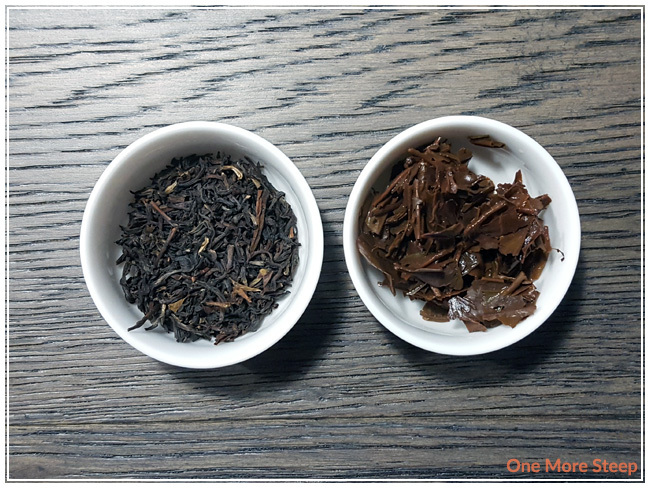 First flush is tea harvested in mid-March while second flush is harvested in June. 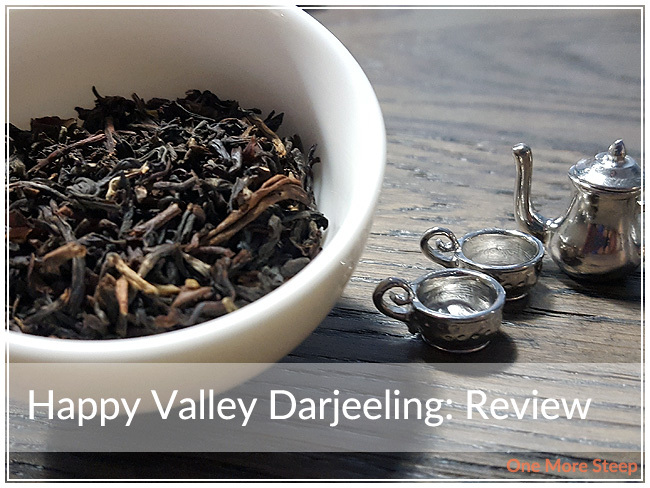 The tea leaves of Happy Valley Darjeeling have a very bright fruity smell to it, I mostly smell fruity tones that remind me of stone fruits (like plums). DavidsTea’s packaging suggests steeping this in “near-boiling water” for 4 to 7 minutes. Their website suggests that near-boiling is 90-95°C (194-203°F). I did my initial steep at the recommended water temperature for 4 minutes. 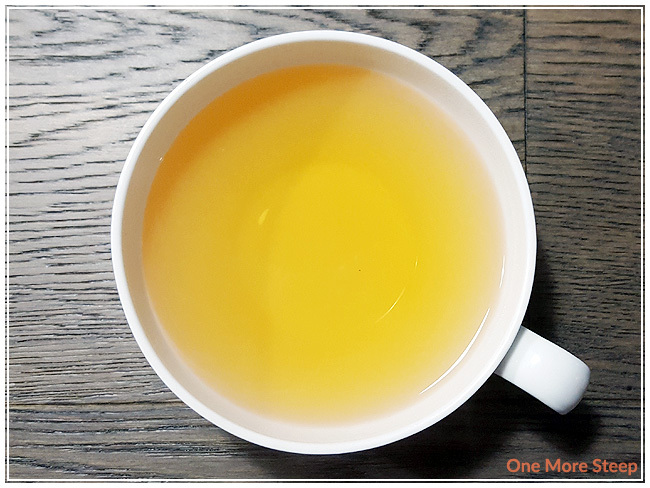 Happy Valley Darjeeling steeps to a beautiful golden orange, there’s a great aroma that wafts up from the tea that reminds me a lot of plums still. There’s a bit of sweetness to this steeped tea that can be smelled. On first sip, I note that the tea is a bit astringent. It’s not overpowering the overall flavour of the tea, so it’s still quite palatable. The plum notes are soft, with the natural fruity sweetness of this tea. The plum notes are delicious, and play well with the astringency in this steeped tea. As Happy Valley Darjeeling is a straight tea, I couldn’t help myself when it came to resteeping this tea. I steeped the leaves again at the same temperature of water, just adding an additional 30 seconds per each subsequent steep. I did a total of three resteeps (four steeps overall) before the flavour started to really be a ghost of what the initial steep resembled. The astringency doesn’t mellow with additional resteeps, and the sweet plum notes held up well until the last steep that I did. I would suggest doing a maximum of two resteeps for this straight black tea. I liked DavidsTea’s Happy Valley Darjeeling. I think as a straight tea, the flavours are nice. 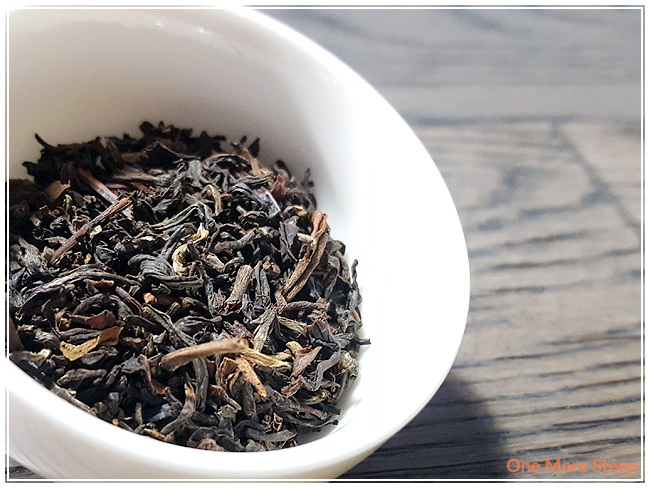 The sweet plum flavours mix very well with the astringency in this black tea, and the tea leaves hold up well for a few resteeps to get more flavour and value out of the leaves. I’m a bit disappointed that I wasn’t able to get more steeps out of these leaves, but I found that the steeped leaves were quite broken up once they had opened up and I could see that they weren’t whole leaves. For the price, I would have expected a few more steeps, but the tea itself is quite good for the steeps that I did do with it. I think the plum sweetness is a delight for the taste buds, and this tea doesn’t need additional sweetener (although that may help to temper the astringency if that isn’t your cup of tea).